We're now into our third major, superpowered crossover and Front Line, Ben Urich's infant newsprint endeavor, is rolling with the punches. Between the Civil War, the Hulk's downtown tirade and now the Skrull invasion, Urich's barely had time to climb out of the trenches, but like a good reporter, that hasn't stopped him from digging to unearth the truths behind these historic events. Front Line has always been a collaborative piece, with one or two featured storylines and a set of short stories and smaller narratives scattered around to broaden the book's perspective. For the Secret Invasion series, that formula has been tweaked: the short stories are gone, and the pair of dueling main plotlines has been split into six equal points of focus around the city. Instead of just Ben and Sally, now we're keeping tabs on Urich, an ER doctor, a cab driver, a designer, his daughter and a police officer. And while that sounds complicated on paper, in practice it does a lot to pull the whole book together. While Reed does tend to overdo it with his dialog, the heart of his story remains interesting. 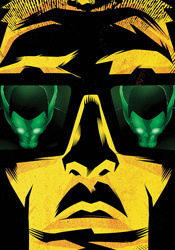 In the same vein as previous editions of Front Line, he portrays the civilian perspective of the Skrull invasion, the view from street level as New York is blindsided by a sudden, jolting alien onslaught. While that's not exactly a fresh concept, as Marvels brought the idea to the forefront almost fifteen years ago, it's used infrequent enough to remain an effective alternative to the flashier, superhero-focused point of view presented in the primary Secret Invasion series. Marco Castello's accompanying artwork has its moments. He brings an animation-influenced simplicity to the page, which keeps the issue easy to navigate, but lacks the emotion and drama that's usually inherent with such a style. In a few specific panels, his characters' emotions are almost laughably mute, like the woman who casually diagnoses a police officer's injuries as though she were writing a grocery list while a twelve-story spaceship zaps the streets behind her. I had trouble getting into Castello's work for the same reason I never really fell head over heels for the Luna brothers or Dreamwave productions – I admire the simplicity of what they're doing, but I can't really get into a story when it seems like its world is populated by robots. The inappropriate emotions and stiff, unnatural poses are such a distraction that I had trouble appreciating the finer qualities of Castello's artwork. That's a shame, too, because what few action scenes he's granted are very well done. This Skrull-focused chapter in the Front Line story is, overall, a much easier read than the two runs that had come before it. The series benefits from the change to a single creative team, and while it's far from required reading, this at least provides a fresh take on the big picture. Flip through it, nothing more.